Fads come and go, as do footwear trends that stay for a season and maybe return decades later for a brief reappearance. Remember “jelly shoes” from the 80s? They were reincarnated about 20 years later and haven’t been seen since. With trends coming and going like a flag in the wind, it is nice to have an item in the closet that you can rely on no matter what — something comfortable, unique and reliable. Such is the case of Minnetonka moccasins. Minnetonka moccasins were originally sold in 1946 at a gift shop in Minneapolis, Minnesota. Back then, you could buy a pair for $3.80 alongside gift shop staples like postcards and T-shirts. Today, it is still a family-owned business and still resides in Minneapolis, despite being about 15 miles away from its namesake city, Minnetonka. Unlike back in 1946, Minnetonka moccasins can now be found around the world, in more than 50 countries. Even famous actors and models appreciate the brand. In fact, Kate Moss created a surge in sales after she was spotted in Minnetonka boots in 2008, and she can still be spotted wearing the brand around London. But you don’t need to be a model to appreciate the moccasin. People from all walks of life buy Minnetonka footwear for its affordability, classic style, comfort and hand-craftsmanship. The company describes its products as “well made to be well worn.” In fact, one of their styles, the P.W. Driving Moc, is made-to-order and takes three days to create. Their artisans use a special type of natural shrunken leather along with a particular blend of oils, waxes and tanning agents, to create moccasins with a beautiful texture, superior comfort and reliable durability. It’s only natural for people to want to copy a successful product. But trying to duplicate Minnetonka moccasins is simply a waste of time. In fact, they are so respected that one major retailer even created its own knockoff brand before being sued for using Minnetonka’s trademarked beaded thunderbird design. Minnetonka Moccasin have come a long way from its basic style from the 1940s, although you can still purchase the originals. They also sell boots, sandals, slippers, sneakers and even baby booties. Shoes start at $30, and more elaborate fringe boots start around $86, making them extremely affordable. And if you use the newest Minnetonka Moccasin coupon, you’ll get a pair of shoes that you’ll own for life for just a fraction of the cost. Buy yourself a pair today and receive 10% off your order with code MOCREWARDS18 at checkout. 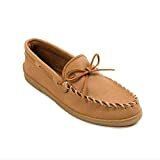 You can find Minnetonka moccasins for the best price on Amazon.